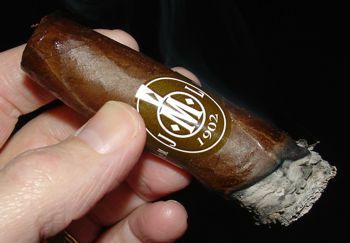 JML 1902, from Miami’s La Tradicion Cubana, is named for José M. Losa, the grandfather of LTC founder Luis Sanchez. 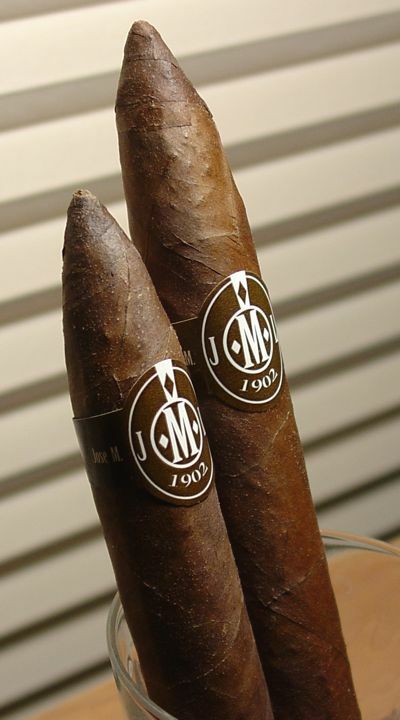 The JML was the first cigar from the new factory in the Dominican Republic after the original factory in Miami was destroyed by fire in 2006. The JML 1902 uses a Pennsylvania wrapper, which is unusual for today but historically well grounded. In the nineteenth century so many cigars were made in Pennsylvania’s Conestoga River Valley that the word “stogie” became common usage throughout the United States. In the past few years the leaf has experienced a resurgence, especially Pennsylvania broadleaf, which has been used by Rocky Patel and A.J. Fernandez in several different blends. Like Connecticut Broadleaf it is often used as binder, but it is less commonly seen as wrapper. Both Connecticut and Pennsylvania broadleaf are grown from Cuban seed, but apparently there’s something about Lancaster County that adds some fight to the leaf. It is generally acknowledged that Pennsylvania leaf is more robust in flavor than the Connecticut variety, and it takes longer to process and mature. These characteristics may be why Penna leaf is less commonly used. The resurgence may be due to the fact that cigar smokers have become increasingly curious and more open to new experiences — sometimes it seems that the rarer the leaf, the better. But the cigar, however refined or rare its components, must still perform well. And the JML 1902 does just that. That said, I don’t think the Pennsylvania wrapper on the JML 1902 is actually broadleaf. It’s thinner, more attractive, and in my opinion more subtle than broadleaf. In combination with a Honduran binder and Dominican seco and ligero fillers, the wrapper adds a sweet sharpness that balances out the blend very well. The vintage appeal of the umber-colored band sets the tone for this cigar. It looks like something you might find in your grandfather’s junk drawer, along with a dried out can of Kiwi and a stitching awl for fixing baseball mitts. 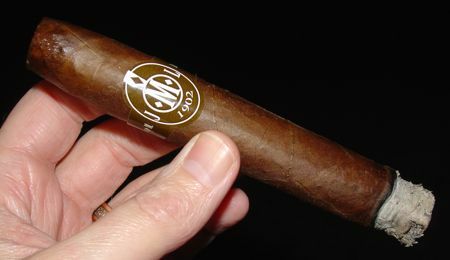 The band is offset by the dark smooth wrapper, a little darker than colorado maduro but not quite maduro. The veins are pronounced enough to make the wrapper rustic without being rough. The roll is solid, though the cigar feels light in the hand. The cap is finished nicely and the tip clips cleanly with a guillotine cutter. It draws perfectly, burns evenly, and the ash is only slightly flaky. The JML 1902 torpedo starts up with a sweet bready aroma, something like freshly baked cookies. (And I know how odd that sounds.) Beneath this fascinating aroma are earthy, mineral-like flavors. The flavor is high-toned, sweet but not creamy, and very well balanced. The smoke texture is medium in body, but it has plenty of strength. Coffee flavors predominate in the mid-section, with sugary, almost maple syrup-like accents on the nose. Earthy flavors continue to occupy the lower register but they gain in strength, as does the aftertaste. The peppery aftertaste takes over in the last part of the cigar, becoming quite strong, even though the sweetness of the wrapper is still detectable. I found I had to slow down considerably in the last lap to keep the cigar in balance. There is a whole lot to like about the JML 1902. It’s complex, flavorful, and for those who like a good kick in the pants, it’s got one in reserve. The balance of subtle sweetness and earthy power is quite impressive. Based on these things alone I’d recommend this cigar to any seasoned smoker, but the best part comes last: the price. The JML is a 3 to 4 dollar stick. $60 to 75 USD per box at LTC’s online shop. That’s a screamin’ deal. This is one of the best cigars I’ve smoked all year, and without a doubt the best cigar in this price range. I can think of no excuse for anyone not to try this cigar. None. Well, maybe one. Some reviewers have reported that these can be a little heavy-handed when fresh. That wasn’t my experience, but it you prefer a gentler smoke, just put them away for a few months and let them mellow. Like any good investment, patience will pay dividends. Excellent review of an excellent cigar. For me the JML 1902 is heavy on the nicotine and laden with lots of flavors. I’ve smoked the 44-guage sizes. As to when to smoke them, very few cigars are at their best right out of the box. Be quiet about the price, for it may make it go up. Thanks for a great review. this looks like a beautiful cigar! fantastic coulour, smooth wrapper. very nice! Okay, okay, twist my arm…box ordered…shipping charges were very steep but it still works out to only $4.40 per stick…an incredible value for a cigar that’s Made in the USA.